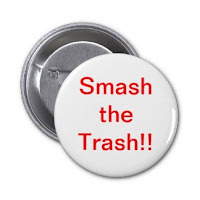 Another Heart Monitor: SMASH THE TRASH! Ever since Sadiella surrendered her life to Christ (Easter 2012), she has become the ever-growing sensitive one in our home. The little girl who used to be full of sass is now full of sensitivity and conviction, and her heart often needs our careful monitoring. Don’t get me wrong—she will catch frogs, play in the mud, and stomp in the rain (in her spinniest dresses) with super-courage . . . But right now she is going through the adjustments of some new inner conviction, and with that conviction she is often in tears, trying to handle a flood of emotion within a six-year-old heart. children. For some reason today, Sadie began to cry as we were leaving. That conversation transpired on July 10th and today is August 19th. Similar things have continued to happen and over the past weeks we are finding that Sadie is noticing e.v.e.r.y.t.h.i.n.g. about people surrounding her—everything that makes her feel even the slightest bit of discomfort. She and I have a pact that she can tell me ANYTHING, and she is taking that invitation to the extreme. I welcome it even though it is exhausting at times, because I know that if she can tell me everything today then she will be more apt to continue to come to me when tomorrow and tomorrow walk into her most life-changing years. When asked how she thought she might be able to overcome these thoughts, she suggested that she could wear a blindfold on her face everywhere and then take it off when she wouldn’t get distracted. I kept our talks going beyond that solution in order to help her think toward some other better, more realistic possibilities. Through our conversations, she is now trying her best to pray for others rather than to let whatever the discomfort is cause her to think bad thoughts, or wish some impossible perfection on others. And in the end, her own heart is set at ease. Here are some of the people she has been in tears over: the daddy in a restaurant with extra large ears, the pregnant waitress with an extra large, extra low belly, the old man with the gargantuan nose . . . and while most are physical features, sometimes she tells me that the behaviors of others will cause her to think thoughts about them, thoughts wishing that they acted differently. We have talked about what happens to people who develop a critical spirit, and have asked the Lord to help her heart remain soft to the needs of others. So, for the daddy with the big ears, she prayed that he would hear God’s Voice in his life to be able to lead his family with a great big love. For the pregnant waitress, she prayed for her baby to be healthy and for her family to have provision and great blessing. When thinking of what to pray for the man with the gargantuan nose, she asked if she could pray for his nose to just shrink. I told her we need to think of something better than that because his nose is just the way God made him. I’m sure she will mention him again, and when she does, I trust that the Lord will lay something appropriate on our hearts for him as well. 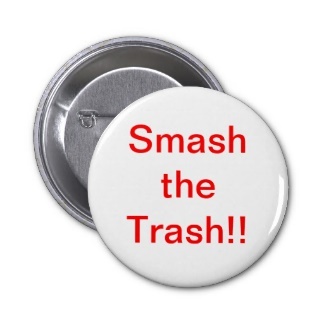 Maybe you and I need to “SMASH THE TRASH!” and ask that God would speak His Great Love for His broken people into our hearts and minds. So the next time someone ticks you off at work, on the road, or even within your own home, replace those negative and critical thoughts with words of life and prayers of blessing. The mouth speaks out of the overflow of all that is stored inside. So store your heart with good, and teach your children how to grab their critical thoughts, and replace them with words of life! We are finding that this exercise continues to reshape and protect the heart, and as a result, a heart-to-love grows stronger.